Trucking is one of the most popular ways to move cargo from point A to point B, whether it’s only a few miles, or across many states. Cargo trucks can carry a wide variety of items, including food, household goods, mail, animals, building materials and more. Sometimes cargo fits perfectly inside of a trailer, but most of the time it needs to be secured in some way to prevent it from becoming loose during the trip or falling off of the truck completely. Unsecured cargo can cause a myriad of issues which can result in serious injury or death to other drivers on the roadways. Loose cargo can cause a trailer to overturn, push itself through the back door of a closed trailer or slide off of the back of a flatbed trailer. In the event a truck’s cargo spills onto the roadway, it can cause a chain-reaction of costly car accidents or vehicle damage. Lawyers know that transportation companies are required to carry motor truck cargo insurance that has at least $1 million in general liability coverage, so whenever there’s an accident involving a cargo truck, they are ready to sue the trucking company. Unfortunately, the cost of these accidents and the resulting lawsuits can quickly exceed the $1 million limit. However, properly securing cargo can help reduce the likelihood of a costly accident from happening. 0.55 g acceleration in a lateral direction. Trucking companies are permitted to use any combination of securement methods. Below are some of the most common and effective ways to secure cargo. Tiedowns (ropes, cords, straps, chains, etc) are the most commonly used method of securing any type of cargo. 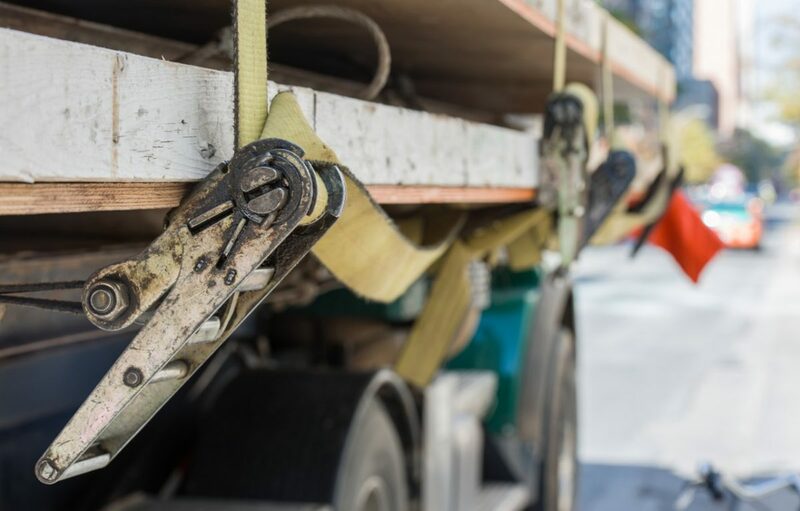 FMCSA regulations require each tiedown to be attached and secured in a manner that prevents it from becoming loose, unfastening, opening or releasing while the vehicle is in transit. Additionally, edge protection must be used whenever a tiedown may be subject to abrasion or cutting at the point where it touches an article of cargo. The edge protection must resist abrasion, cutting and crushing. If rub rails are used, the FMCSA requires the tiedowns be utilized inboard of the rub rails whenever possible. Each tiedown type used must be able to meet a specified Working Load Limit (WLL), calculated based on the weight of the load. Dunnage or dunnage bags often used in conjunction with tiedowns to properly secure cargo. When cargo doesn’t perfectly stack together, even if it is tightly strapped down, the open spaces between items can allow just enough room for shifting. Dunnage is just loose materials that are placed in between articles to protect and support the cargo. Similarly, inflatable dunnage bags can be used to fill empty spaces between pieces of cargo, or between the cargo and the wall of the trailer. Also used in conjunction with some type of tiedown, chocks and wedges are used to prevent rounded cargo from rolling while in transit. Other special securement requirements may apply to certain items like logs, concrete pipes, metal coils, heavy machinery and more. Commodity-specific securement requirements are all outlined on the FMCSA site. Trucking Insurance ATM Insurance, Cargo insurance, Motor Truck Cargo Insurance, Motor Truck Cargo Liability, Securing Cargo, Trucking, Trucking Insurance permalink.